The temperature at the moment is very hot and humid, therefore my daily walks to the market and back will suffice until it cools a little and I can do more exploring. 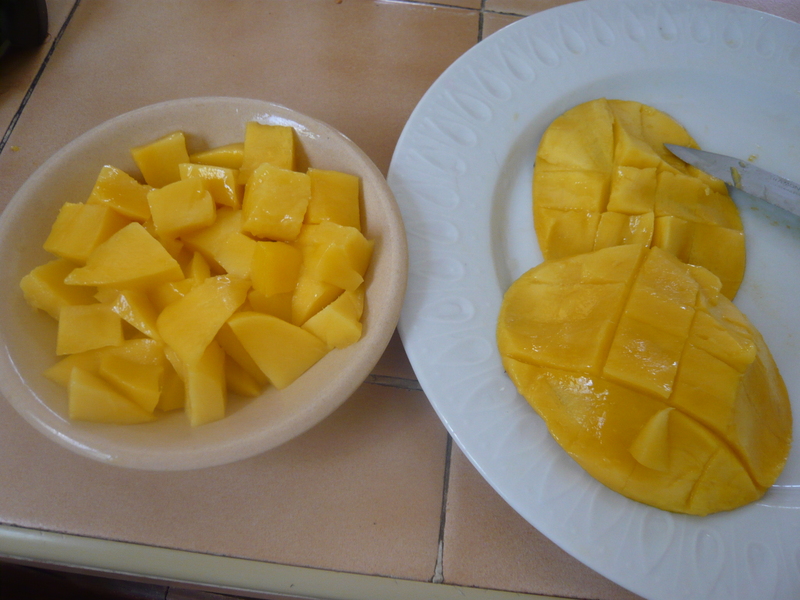 The following are some tropical fruits of the region, and the way I prepare them. In this tropical climate certain fruits are available in abundance, and very inexpensive. 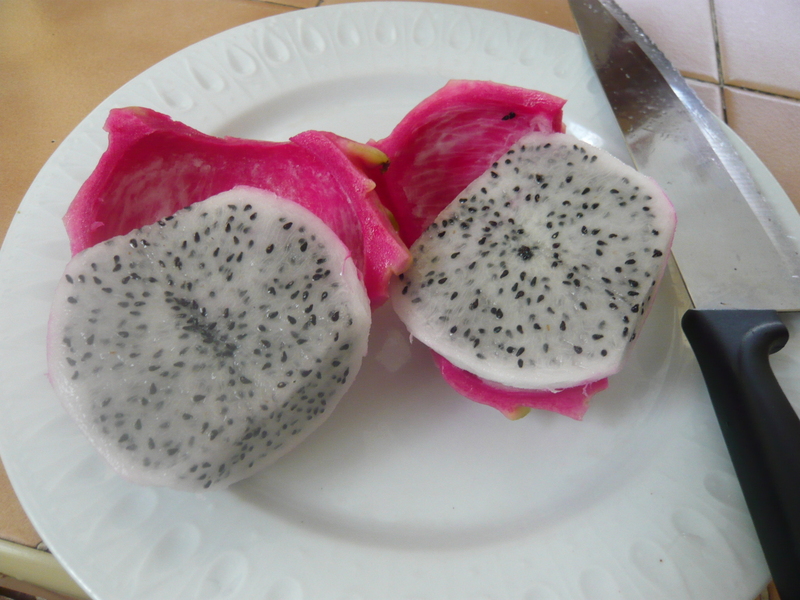 One fruit I had never tried before is Dragon Fruit (Pitahaya), originally from Mexico and Central America and is now grown in many other parts of the world. 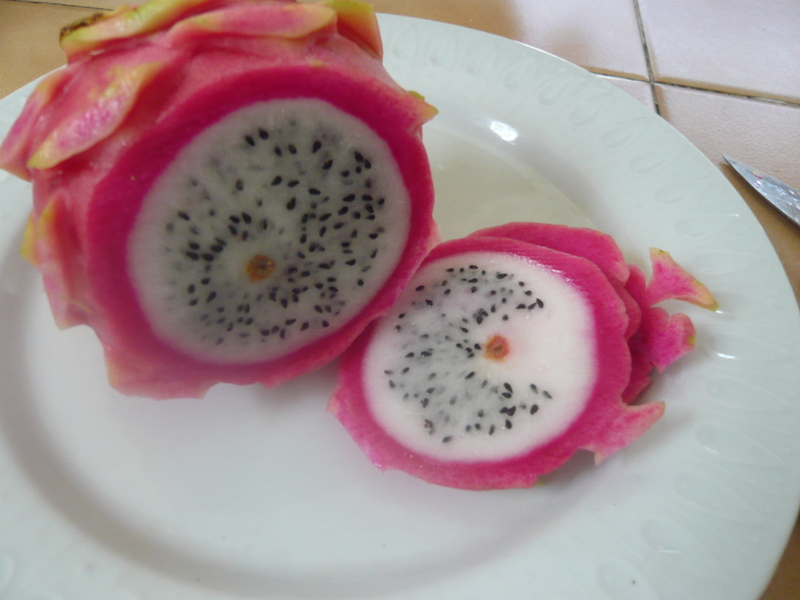 The Dragon Fruit grows from a climbing cactus plant. 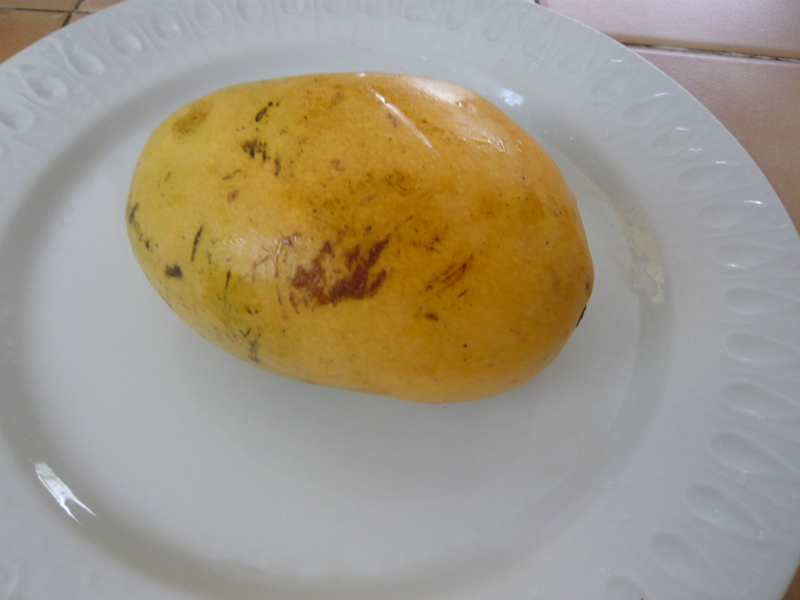 To check to see if it is ripe gentle press the pink skin it should be soft to the touch like a ripe mango or avocado. This fruit tastes slightly acidy with a touch of sweetness, something like a kiwi (kiwi is not related however) but crisper. When I brought the first one home from the market I had no idea how to eat it let alone peel it. So after making some inquiries I found it was very simple. First cut off the hard green spikes. Then wash the outside well and dry with a paper towel. Next, trim of the ends and cut in half. 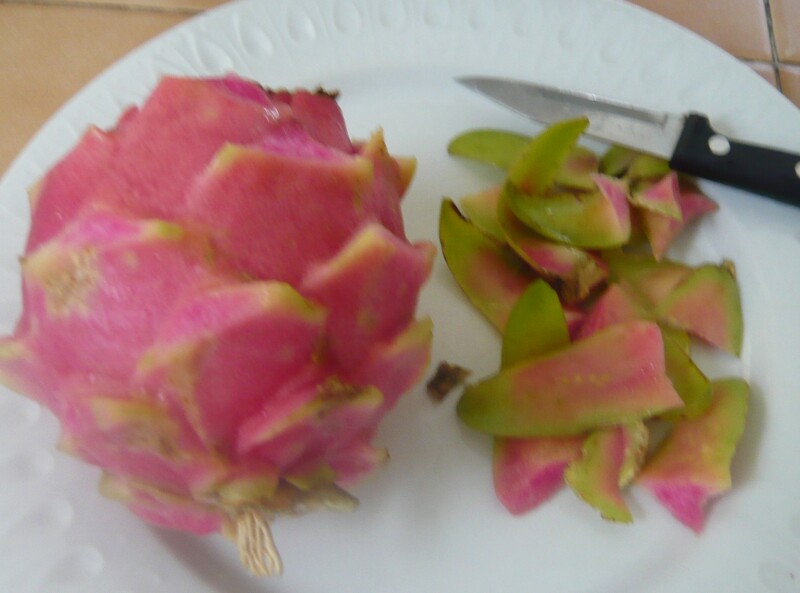 The pink outer skin is not edible but can be gently peeled off the fruit in one whole piece. Once the outer skin is removed, slice the fruit into small portions and that it. Tastes best chilled. 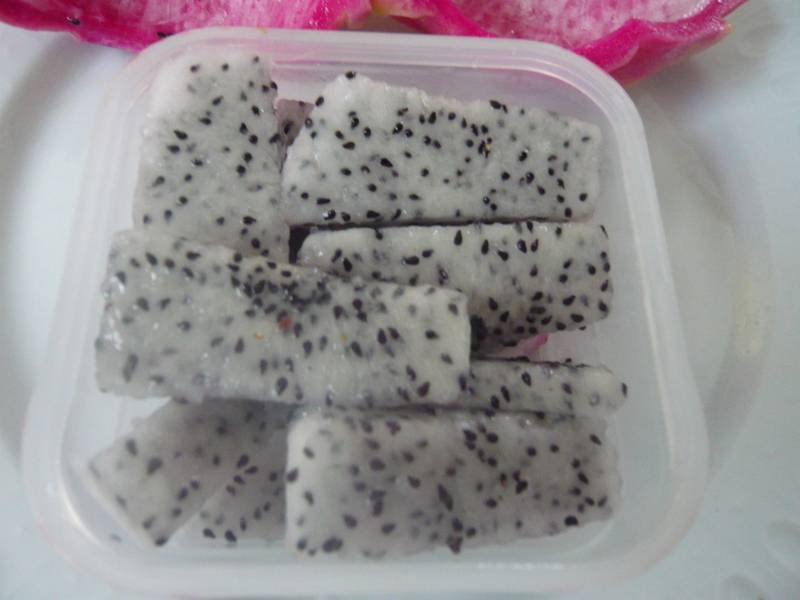 A lovely refreshing tasting fruit to eat as a snack or mix with other fruits or vegetables. The cost is approx. 30 cents USD depending on weight. The health benefits include vitamin C, a few of the B vitamins and antioxidants, omega 3 fatty acids, and more. 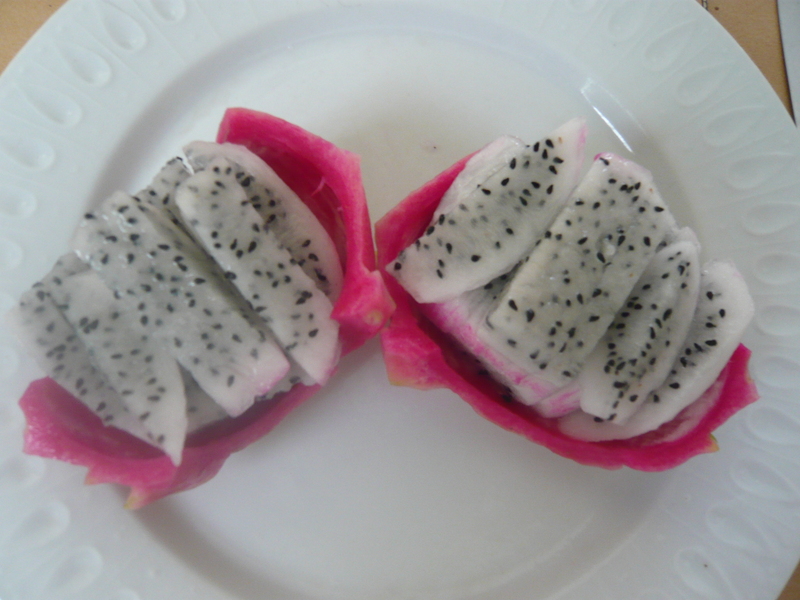 Dragon Fruit Health Benefits and Recipes . MANGO. 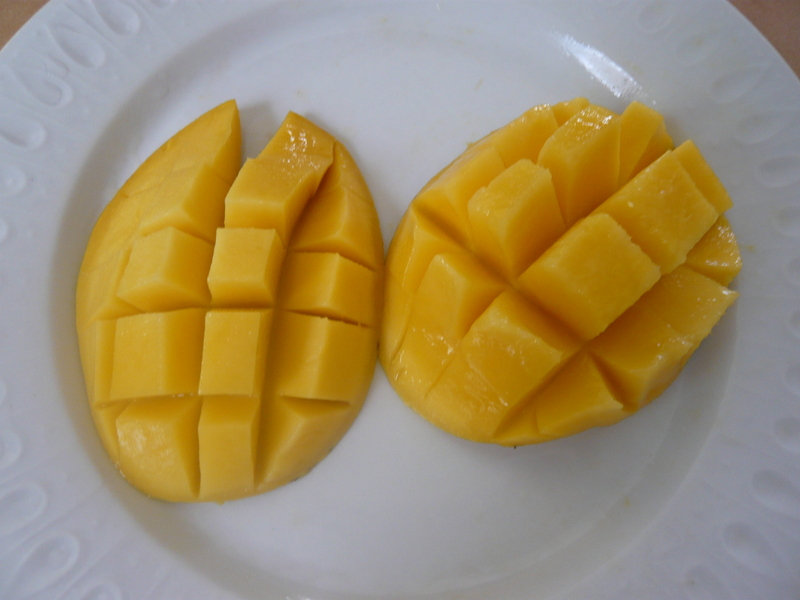 Mango is my favorite fruit, I found here in Mexico lots of the yellow skinned mangoes not just the red skinned ones I’m familiar with in the US. The yellow ones have a smoother taste, almost creamy, in comparison to the red ones,however they are smaller generally. The one in the photo below comes from the local market, sometimes the outer skins are not too attractive, but as long as there is no bruising, and they are soft to the touch, the inside is delicious. 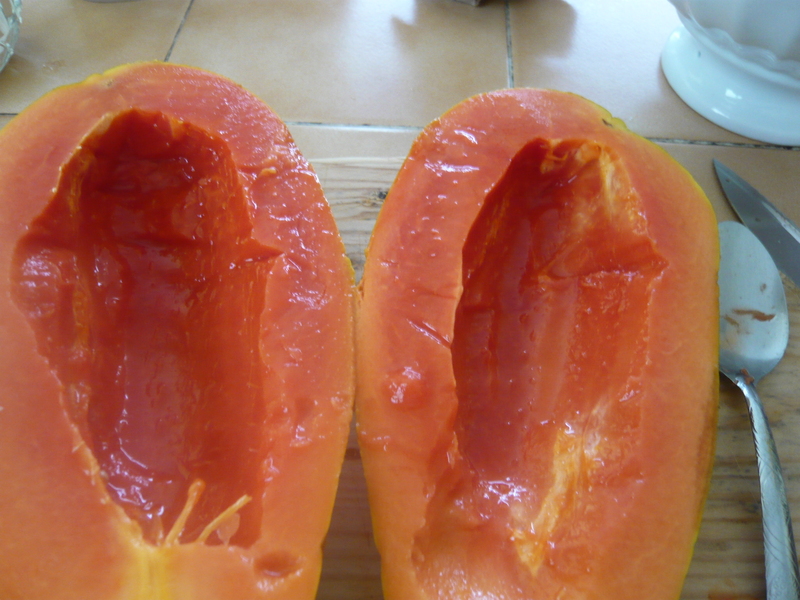 PAPAYA is another tasty, healthy fruit found in abundance here in Mexico and very inexpensive. 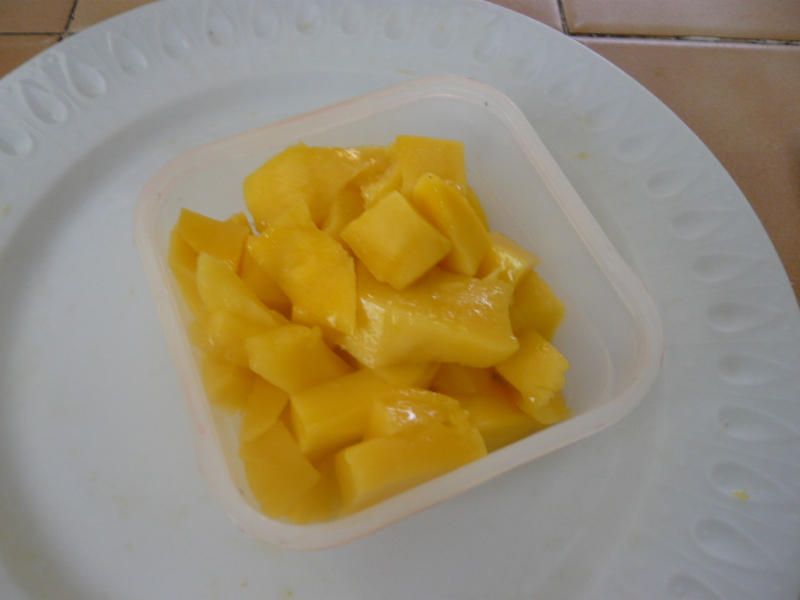 Many of the locals like to eat both mango and papaya with chili powder sprinkled on them. 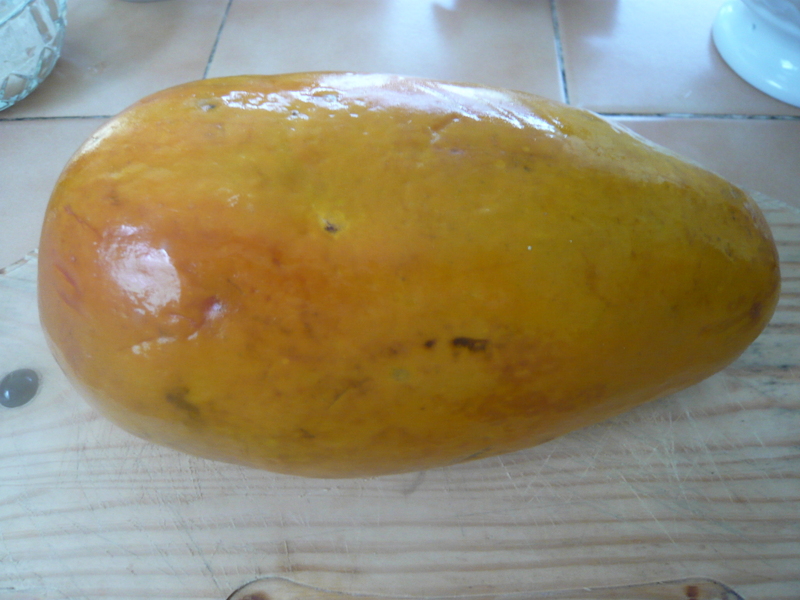 The papaya pictured below costs approximately 60 cents USD. and is medium sized. I’ve found when buying a papaya it should be slightly soft when squeezed gently to ensure it is ripe all over. 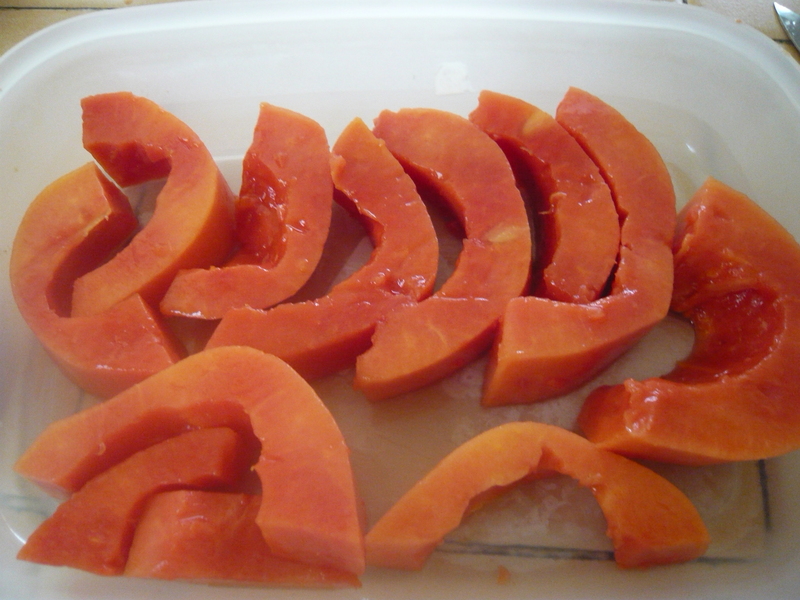 The way I prepare papaya is first give the skin a good wash and dry then cut it in half lengthwise, scoop out the black seeds and any stringy pulp next to the seeds. Slice into sections, and lastly cut the peel off the sections. I cut the peel off last as papayas are very soft and more difficult to handle without the skin. The health benefits of papaya include dietary fiber, folate, vitamin A, C and E, smalls amount of calcium, iron, riboflavin, thiamine and niacine. More benefits of Papaya. 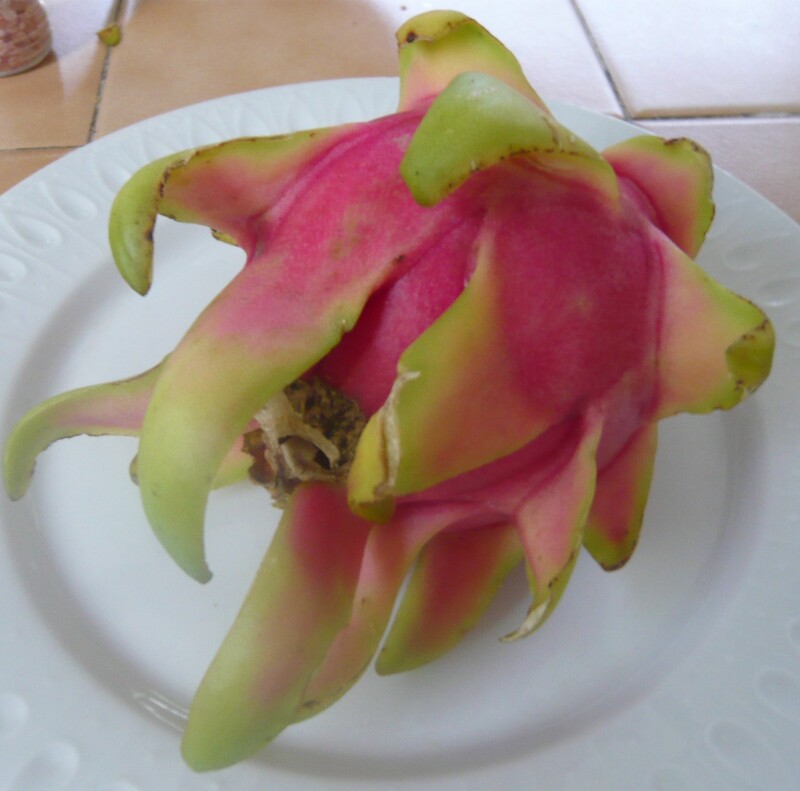 Of course there are many other tropical fruits but I haven’t tried them yet!. 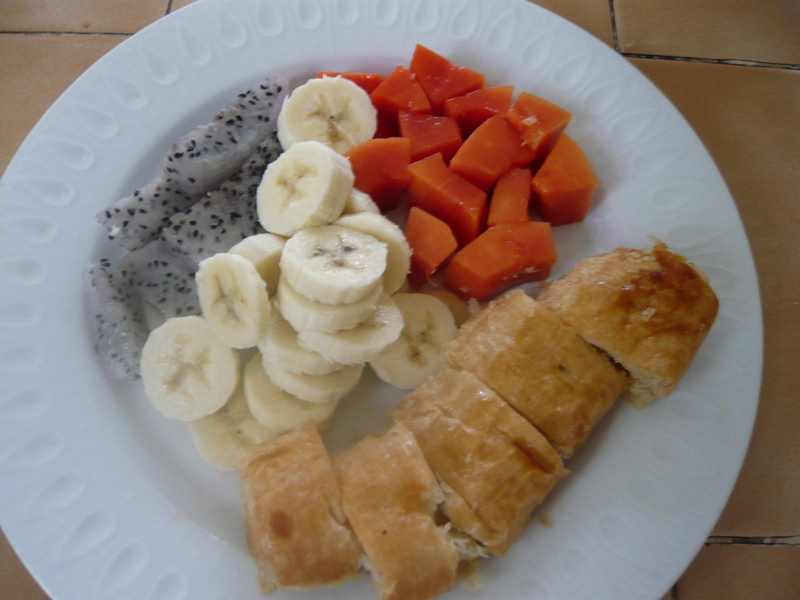 Papaya, Dragon Fruit, Banana and Apple filled pastry. 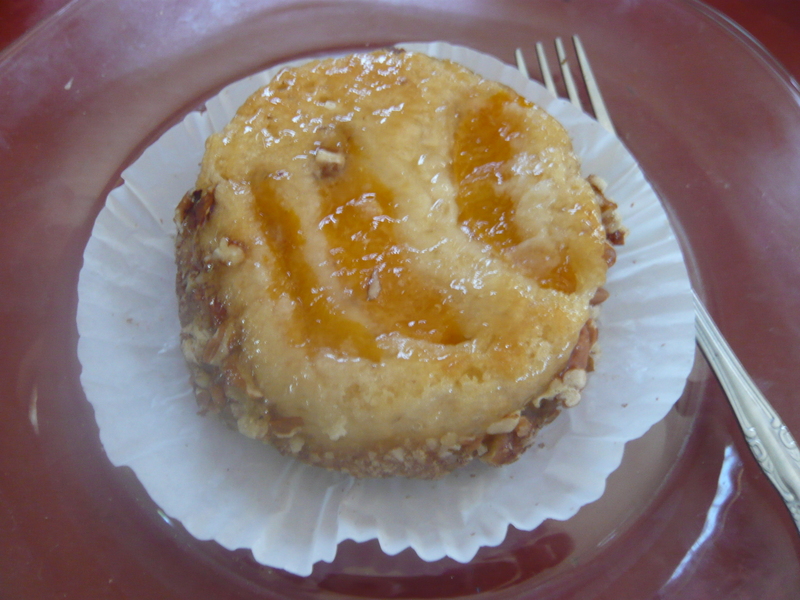 The apple filled pastry tastes like apple turnover, I buy the pastries at a supermarket called Chedraui, they have a lovely fresh selection of pastries, in Spanish they are called “Pan Dulces” (sweet breads): Below is a photo of my favorite. They are indeed Brittany still lots I haven’t tried yet. I wanted to congratulate you on your nomination fot Sisterhood of the World Blogger Award, you deserve it your blog is great!